Review: Tilly Tennant is a new author to me, but I was pleased to give this book a try as it sounded right up my street. Although the bakery of the title is central to the story, the whole tale is a wonderful and entertaining mix of romance and suspense. 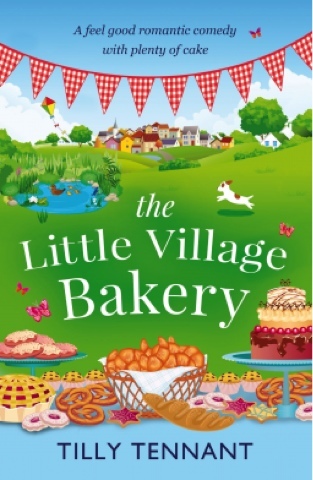 The main character in the story is Millie, who has landed up in the little village of Honeybourne, where she has bought the old and, as it turns out, rather dilapidated village bakery. At the beginning of the tale, we have no idea what has driven Millie from her life in the town of Millrise to buy this building unseen with the idea of establishing a new life and a new business for herself. There is just the hint of a very tragic incident in her past that has led to her persecution by other people in the town and made her want to flee. Honeybourne turns out to be a rich source of interesting characters, as can be found in many small communities. These include: Jasmine, a great friend to Millie from day one; her husband, Rich; her rather layabout brother Dylan; a local schoolteacher, Spencer; and, last but not least, the local busybody and source of much amusement, Ruth. A somewhat less pleasant character appears from Millie's past in the form of Rowena, who was really quite scary. I found the story a little difficult to get into initially, especially as I wasn't sure what kind of person Millie was going to turn out to be. However, it soon began to grab my interest, and in the end had me picking it up at every opportunity to find out what would happen next. There were some incidents that had me laughing out loud and other parts that made me fearful for the village's inhabitants. All in all, I thought there was an excellent mixture of mystery and romance throughout. The whole book was very well written. Tilly has promised another story focusing on these characters soon. I shall be looking out for it with anticipation.